I wish to God that these Republicans would get over their irrational paranoia that a dead person might vote. This isn’t 1950s Chicago or 1930s South Texas, people. I remember how much Paul Bettancourt complained that there were thousands of dead voters still on the rolls when he took over after 51 years under Carl Smith. And Mr. Smith said he figured it made no sense to purge voter rolls, even if they thought someone might be dead, or hadn’t voted in years. It didn’t matter to him, because maybe that person was alive and decided one day, after years and years of apathy, to get out and vote. And he wasn’t going to stand in their way because there was no harm to leaving their names on the voter rolls. I’m not worried about a dead person voting. 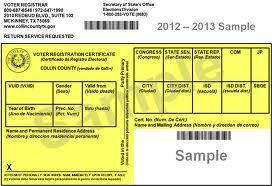 I am worried about a live person using a dead person’s registration to get a mail in ballot. Or two. Or three, etc. Accurate voting rolls matter to campaigns, too. I hate to think how much postage is spent and how many trees are cut down to mail letters and campaign brochures to persons who long ago died or moved out of a neighborhood. On my one block in the Heights I have two dead voters still on the list, and 9 who no longer live in the neighborhood. Two of those moved away in the late 1990s. This is out of 32 total registrations. Well-managed campaigns buy voter lists from services that enhance the data with all manner of important information, from a person’s voting history to his or her ethnicity and phone number. That information is not included in voting lists purchased from the county, so most campaigns do not use them. County voter lists having or not having dead people on them have little effect on whether direct mail pieces are wasted. And in my experience, the cases of mail ballot fraud involve stealing ballots from qualified voters (read not dead) and casting votes as the thief saw fit, or a third party harvesting ballots (before subsequent law made that more difficult) and selling the vote to the highest bidder. I know this may be hard for a lot of Republicans to believe, but just isn’t the kind of widespread voter fraud that you’re so afraid of just doesn’t exist in modern America. The more likely explanation for a Republican candidate to ever lose a race for public office is that more actual voters preferred and voted for the Democrat rather than unqualified people illegally casting fraudulent ballots on their behalf.